W 1588. FANNY CAMPBELL THE FEMALE PIRATE is the scene depicted on the front of this nice 19th century sperm whale tooth. Classic scene that was copied from one of the pamphlets containing variations of this image along with the story of the fictional female pirate. For more information about her see Frank's "Ingenious Contrivances, Curiously Carved" and Flayderman's "Scrimshaw and Scrimshanders", pgs 78–79. This engravers version done using soft polychrome colored shades of red, blue and green. Nicely shaped and smoothed tooth that measures 6" tall x 2 3/4" wide. Mounted on a thick teakwood base. 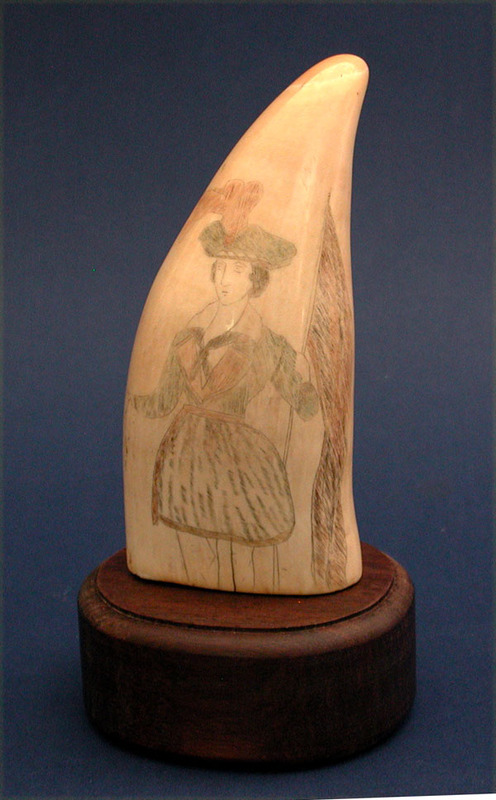 Nice example of subject matter that is found in most scrimshaw collections. Ex Bill Boylhart collection.